The new Mercedes has progressed dramatically in appearance with a bold new look dominated by what the German car makers head of design describes as the "predator face". It has also been rumored that the new Mercedes Benz A-Class could most definitely be more advanced than the C, E, and S-Class. The new exterior structure has been significantly re-engineered with greater use of aluminum and high-strength steel, which will bring a reduction in weight compared to its predecessor as well as a large increase in torsional rigidity. Some features include a wide and relatively low set grille together with slightly thinner headlamps that extend back into the front wings to provide the front end with a heavily tapered appearance. The A-Class retains the practical five-door layout of its predecessor, however, it has grown dimensionally. The length of the car has increased by 120mm totaling at 4419mm, while the width has grown by 16mm to 1796mm. The wheelbase is also longer by 30mm, however, there are no details about the track widths. For the first time, the larger wheelhouse will allow Merc to offer 19in wheels as options on non-AMG models. The interior has also boosted accommodation space, with the headroom being increased by 7mm in the front and 8mm in the back, while shoulder room increases by 9mm at the front and 22mm in the rear; elbow room has gained 35mm up front and 36mm at the rear, offering all of this extra interior space. The new entry-level Mercedes-Benz is also said to boast improved visibility thanks to the adoption of slimmer A-, B- and C-pillars. Larger door apertures are behind the claims that the new A-Class offers improved entry, particularly to the rear. Mercedes-Benz describes the highlight of the interior as a widescreen cockpit that provides a safer means of digital menu hopping. 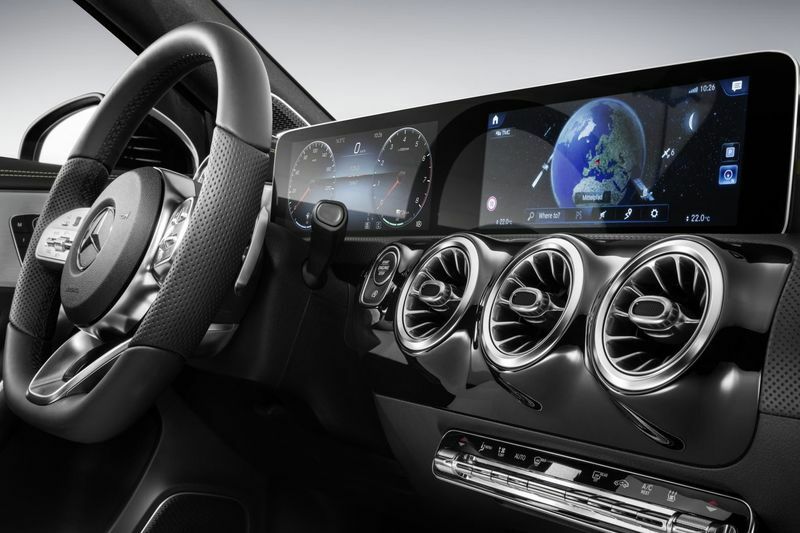 The fourth-generation A-Class will also be the first modern-day Mercedes-Benz model to feature touch operation for the infotainment and navigation functions within the centrally mounted monitor via a sixth-generation Command system. If you love your optional extras you have many to choose from with the 2018 A-Class, including; Head-up display unit in full color 480x240 resolution, voice control system with conversational dialogue, massage function seats, steering wheel heating, and an ambient light function that offers 64 different colors with illuminated ventilation ducts. All of the drivers assist technology will come standard with the new Merc. The engine is turbocharged with four-cylinder engines, combined with either a six-speed manual, in-house produced seven-speed dual clutch, or an all-new nine-speed dual gearbox depending on the torque rating of the new car. Initially, the car only sports a 2.0-litre engine that supports 188bhp in the A200 and a gutsier 221bhp in the A250. Extra power, however, comes from an impressive belt-driven generator and 48-volt electric architecture that allows an electric boost function, which pushes output to 302bhp along with a sturdy 302lb ft of torque. Expect to pay around R437 200,00 for the standard A200 and R552 200,00 for the A250 Sport. Check out the vedoe below and leave us a comment. Video: Watch An Old Vw Beetle Whip A Brand New Mercedes C63-s Amg!